Gordon Feller is the Co-Founder of Meeting of the Minds, a global thought leadership network and knowledge-sharing platform focused on the future of sustainable cities, innovation and technology. He serves as a consultant to Cisco focused on Internet of Things and Talent. Gordon has worked in the area of emerging technology for three decades, most recently consulting on projects which harness the power of data (whether in the cloud, pulled via mobile networks from IoT-enabled end-points, or other advanced technologies) for solving complex problems. From 2010-2016, Feller was the Director of Urban Innovation at Cisco Systems headquarters in Silicon Valley where he served in an executive capacity within the company’s programs focused on cities. Prior to joining Cisco, Feller was the CEO of Urban Age Institute, an international non-profit research and training organization which began inside the World Bank and spun off in 2001. For 30 years, Gordon has advised on economic and technology issues with leaders of multinational companies, cities, NGOs, foundations, and national governments. His clients have included The World Bank, UN, German and Canadian national governments, The Rockefeller Foundation, IBM, Reuters, Metropolis, United Cities & Local Governments, among others. Gordon advises leaders on harnessing the power of advanced technologies which can enable them to solve complex problems with a special focus on practical solutions where economics, technology, and sustainability intersect. You can contact Gordon at gordon at cityminded dot org. With the arrival of new and powerful technologies and the declining costs of these technologies, some new possibilities are emerging for cities and their transport systems. For example, the Internet of Everything (IoE)1 can benefit cities by connecting people, processes, data and things as everything comes online. This is creating unprecedented opportunities for organizations, individuals, communities and countries to realize dramatically greater value from networked connections—including economic growth and improvements to environmental sustainability, public safety, the delivery of public services and productivity. The potential here is for cities to become truly transformed. There is much debate about the potential value of the Internet of Everything. But what is it really? IoE is the intelligent connectivity of smart devices, and is expected to drive massive gains in efficiency, sustainable growth and quality of life. In other words, when objects can sense each other and communicate, it changes how and where and who makes decisions about our physical world. This is especially meaningful for private enterprises and public institutions, that can find more operating efficiencies, deliver greater value to customers, employees and citizens in general, and enable new business models. IoE has its roots in industrial automation, noticeable recently in the convergence of operational technology (OT) and information technology (IT). The explosion of data and data analytics enabled by cloud computing. The growing interconnectivity across industrial/operational devices and growth in the number of smart mobile devices. The convergence of networks both industrial and enterprise that are enabling applications such as video surveillance, smart meters, asset/package tracking, fleet management, digital health monitors and a host of other next-generation connected services. Connectivity means more data — gathered more frequently from more places, which in turn means more visibility and more ways to increase efficiency and productivity, while improving safety and security. Analyzing data provides an even more sophisticated way to redesign entire processes and create new opportunities. Smarter decision-making separates control systems from machines: already smartphones can remotely manage a number of physical objects like security cameras, thermostats and lights. Organizations of all kinds (for-profit; governmental; non-governmental) are facing increased pressures in nearly every industry to get their products and services to market more quickly, meet changing regulatory requirements, and at the same time innovate while obtaining greater operational efficiencies. Growth in the number and types of devices as the result of a mobile workforce, supply chain partners and the “consumerization” of business tools (anytime, anywhere, pay as you use technology enablement) are presenting network coverage and security challenges to nearly every organization. To meet these challenges, businesses must become more agile and stay ahead of their competition and quickly respond to market and technology changes. An IoT platform (across the infrastructure and applications) can help businesses meet these challenges and make organizations more innovative, efficient and competitive. However, the implementation of an IoT platform can bring challenges of its own. Disparate systems, machines and their proprietary protocols need to be managed, integrated and secured. Connecting sensors, objects, machines and devices with a simple, end-to-end infrastructure can be challenging without the right strategy and planning and the right business partners. In addition, networking machines that have never been connected will generate vast amounts of data that will only be useful if harnessed effectively with a reliable network that can scale massively, offer high resiliency, provide near real-time access as well as end-to-end security. The opportunities can far outweigh the challenges if managed with the right partner. The connection of devices, machines and things will provide the opportunity to dynamically generate, analyze and communicate intelligence for businesses to increase operational efficiencies and power new and greatly improved business models. With IoT, businesses will be able to find new ways to innovate and realize greater efficiencies with suppliers, distributors and channels throughout the business value chain. IoE is a global phenomenon that is changing the way cities grow and thrive. IoE brings together people, processes, data and things to make networked connections more relevant and valuable than ever before. Today more than 99 percent of things in the world are not connected. But there is good news: it is estimated that by 2020, 4.5 billion new people and 37 billion new things will have connected to the internet.2 In the near future, the growth and convergence of information, people and things on the internet will make networked connections more relevant and valuable than ever before, creating unprecedented opportunities for countries, industries and individuals. The network plays a critical role in the IoE: it must provide an intelligent, manageable, secure infrastructure that can scale to support billions of context-aware devices. How are cities capturing the value of IoE? With their access to cutting-edge technology and innovative solutions, cities are finding ways to leverage their technological power to transform the way they do business, the way citizens connect to services and to government agencies, the way that urban communities create lasting bonds between and amongst residents and visitors. The city’s ability to build, manage and secure end-to-end IP-based platforms translates into the connections between things, people and information. Today’s urban leaders know that the future is coming fast, and it is just around the corner. They are asking: how can all this connectivity help me grow my business, deliver better services and experiences and open up new possibilities? They are no longer just looking for a technology provider. They are looking for a strategic partner who understands their needs and can help transform their business. They are looking for the intelligent connectivity that can help them to create sustainable value. Numerous technologies make it possible to turn dumb and isolated buildings into hyper-connected buildings. Facilitating scaling and security without significantly increasing the data center’s energy or physical footprint can be done by replacing bladeservers with sophisticated storage solutions and by using advanced energy management applications. Time-tested solutions are now solving these problems. How can a high-speed broadband network make a positive impact on economic development? Information and Communications Technology (ICT) is transforming how the world responds to economic growth and job creation challenges. Just as ICT transformed the publishing, education, healthcare, retail, manufacturing and financial services industries, so too is it already altering the economic development landscape — helping address the issues that are front and center for every town, city, state and nation. How can the network aid an economic turnaround? Organizations all over the world are dramatically increasing the positive impact of new technologies by changing the way we all do business — shifting operations and altering organizational behavior. The network has now become a key technology enabler for those seeking to change how the economy works, how government delivers services and how our schools train the next generation of innovators, inventors and workers. The network is being used for much more than merely reducing costs. Connecting home and/or office electronic devices to the network provides office managers and consumers with the ability to monitor, manage and reduce energy use by creating the visibility that is essential to understanding how and where, in real time, electricity is being consumed. In addition, cities are reducing wasteful waiting times and non-productive commuting times by bringing information to users instead of bringing users to the sources of information. Consider the transport challenges facing most cities: traffic congestion is often not really a capacity problem but a load management problem, much like the internet. The movement of people and traffic in cities can be as efficient as the movement of traffic on the internet. Whether in energy, or transport/traffic, or buildings, the same rule applies: technology advances have made it possible for complex systems to be managed- and self-managed in radically different ways. The network can be an important tool for addressing the impact of urban areas on the environment. High connectivity is proving to be the key. The network has changed the patterns and the means by which the economy functions. And it will change the ways we work at our jobs. The future of work is far more than connected buildings and connected workplaces. 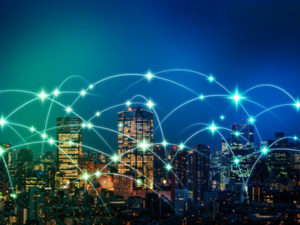 Hyper-connected buildings use an IP network to converge all of the systems and all of information, communications and building technologies. Hyper-connected workplaces bring productivity down to each square foot; consolidating office space requirements saves energy, effort and other resources. Every organization that owns, operates, or uses real estate, is facing harsh realities; In most cases, these buildings are the second-largest expense for many organizations. For commercial real estate developers and owners, real estate is their core business and it is through innovative leasing and solutions that they differentiate themselves from the competition. In North America alone, new real estate worth more than $600 billion is built each year, at least during ‘normal’ economic times and owners and developers spend approximately the same amount for retrofits and renovations. This is in addition to the more than 100 billion square feet of space already in the market, of which more than 60 percent is 30 years of age or older. One not-so-well-known fact is worth recalling here: the massive quantity of existing real estate and the large production of new buildings contribute to nearly 50 percent of the EU’s carbon emissions, making real estate the single largest contributor to that continent’s environmental paradigm. Consequently, the network is having a significant impact on all aspects of designing, building, using, owning and operating real estate and the spaces in which we live, work, play and learn. At the same time, if buildings are designed with hyper-connectivity in mind, the building owner pays less for cabling infrastructure, cable trays and even the cubic content of riser management (the room-size risers in high-rises that accommodate the cabling infrastructure for IT and building systems). Collapsing disparate and multiple cabling infrastructures can result in 20-30 percent less cabling in each building: the average cabling per workstation in an office environment is more than 1,500 feet. Environmental stewardship starts with knowing how much energy is being consumed, why and where. In today’s situation, it is rare for an operator or owner of real estate to know how much energy is being consumed at any given time. The most granular one gets is the summary in the utility bill at the end of the month. The network integrates energy management systems to provide the ability to abstract the appropriate information from energy systems and produce real-time reporting capabilities of actual energy consumption. This allows building managers to monitor and measure energy consumption at great granularity; providing the ability to specifically respond to energy consumption patterns (unplugging devices if they consume but are not used or turning off lights in spaces at times when they’re not used). The building owner can now automate “cause-effect” relationships between the building systems and the energy management. In office environments, approximately 40-50 percent of the space is usually underutilized. It costs the organization rent, heating, cooling, operational fees, etc. to provide for this space. However, the network has been the breeding ground for innovative technologies that can help significantly optimize space utilization. The hyper-connected workplace is a flexible work environment, enabled through use of technology, which converges all IP communications, wireless networks and VPNs. Employees work at a variety of desks, conference rooms, outdoors, homes and remote locations equipped with networking capability-enabling anytime/anywhere productivity. Hyper-connected buildings use an IP network to converge information, communications and building technologies. This results in more sustainable benefits, with centralized operations, management and efficiencies. Connected workplaces take sustainability down to each square foot; consolidating office space requirements saves energy, effort and other resources. eliminated desktop computers, personal appliances, etc. Smart urban development starts with a solid foundation. What some now call ‘the fourth utility’ is really the next generation information network. In addition to the plumbing, piping and wiring in a building, the smartest developers and building managers now add an IP network to the fabric of their property. Not much unlike the other utilities, they lay the groundwork to design and install systems that interact with and communicates over this one network. A secure, flexible and scalable network reduces Capital Expenditure by tying together all of the disparate networks for the communications, security and building automation systems. With such strategic impacts on organizational transformation, the network should be considered much earlier in the building life cycle than it normally would be. More than 75 percent of the lifecycle cost is incurred in the operation stages. The ability to impact cost during the operation stages is much earlier in the lifecycle process. Historically, building and work place design do not include IT considerations and IT design is not dealt with until after delivery of the property. This, then, is too late to have the opportune impact. Combined, however, real estate and IT provide such impact on the way the facility serves the company, the planning and design of the IT and building systems convergence needs to be considered when the ability to impact on the cost and functional design is greatest and where cost of changing the building design is lowest. Further in the lifecycle, it will be not only more expensive to implement the changes, but the impact hyper-connected buildings has on real estate functionality and operations could be lost. This lifecycle and the notion of entering integrated building, workplace and IT design in the strategy stages works for any new developments. Every owner goes through the same cycle for each and every renovation and major renovation activities. Although the ultimate financial impact might be different, it is never too late to consider connectivity, as the investment, will pay for itself due to reduced cost in operations and increased productivity and revenue. Technology affects every aspect of the way people live, learn, play and work. However, today’s building environments are largely obsolete and have not evolved to support these changing lifestyles. In addition, key trends are driving the need for building transformation — trends such as globalization of the workforce, the drive for environmental and social responsibility and a growing, worldwide population. As user requirements evolve, buildings must adapt and change. Real estate professionals must take steps to transform the physical spaces of the future through technology innovation, delivering value-added, revenue generating services while streamlining the processes that create buildings and developments. The network becomes an intelligent building infrastructure and the foundation for change in any development project — adding value to education, financial services, healthcare, commercial real estate, hospitality and corporate real estate projects. Intelligent building infrastructures create an unprecedented opportunity for improved services, enhanced processes and cost-effective operations for everyone who uses or creates buildings, worldwide.